Jio 100 percent Cashback: Surprise offer for all Jio Family by the company for this festival season. While all the network operators are busy with their exciting offers on amazing price discounts. Reliance Jio also now joining in that battle by giving new deal as the next level of promotion during the Diwali festival. The operator introduced the Jio Diwali Dhan Dhana Dhan offer. From this surprise gift, the users can get 100 percent cash back on their next recharge of Rs 399 between 12th October to 18th October. So, the deal started already from Thursday morning. This Reliance Jio Diwali Dhan Dhana Dhan offer is applicable to all Jio customers. After expiry of the current plan, this plan will be activated on your number. So, the customers will get the cashback in the form of Rs 50 vouchers. All the vouchers will be allowed to redeem after November 15 for only the plans of Rs 309 and above. Also, the vouchers can be used for the data add-ons of more than Rs 91. Best Surprise Deal: You can share your vouchers with your friends and families as a gift of Diwali. The company has also announced this update publically on their official website and also on their Twitter account as “A festive surprise for our Jio family – Recharge for Rs. 399/- and get 100% cashback! Here’s wishing you a #JioHappyDiwali #WithLoveFromJio” along with an image. 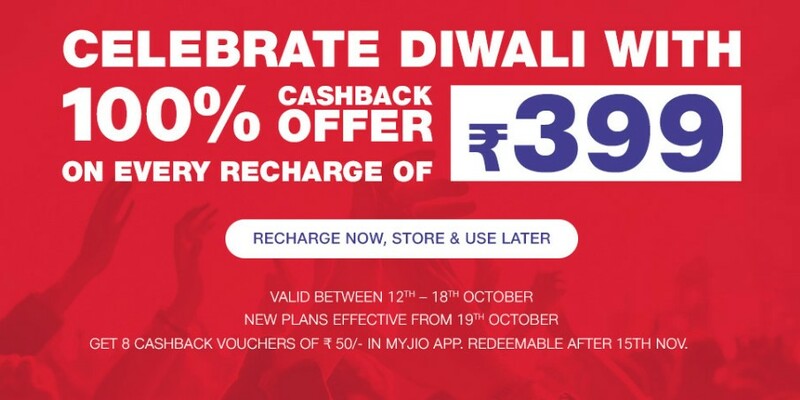 Jio customers can recharge through the apps, websites, stores of MyJio, Jio.com, Jio Stores, Reliance Digital, partner stores and digital partners like JioMoney, PayTM, AmazonPay, PhonePe and Mobikwik. So, get Jio 100 percent cashback by recharge on Rs 399 through above-given apps and websites within a week between October 12-18, 2017.